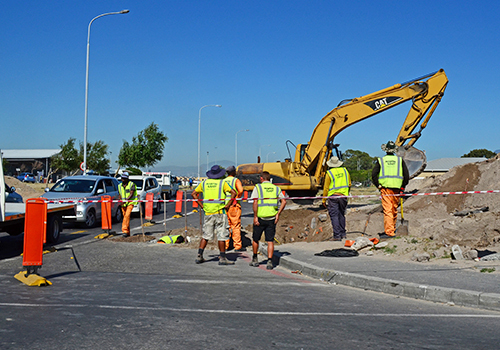 Work has started in Stock Road to prepare for the expansion of the MyCiTi public transport network, with contractor Martin & East having begun grading and clearing work. 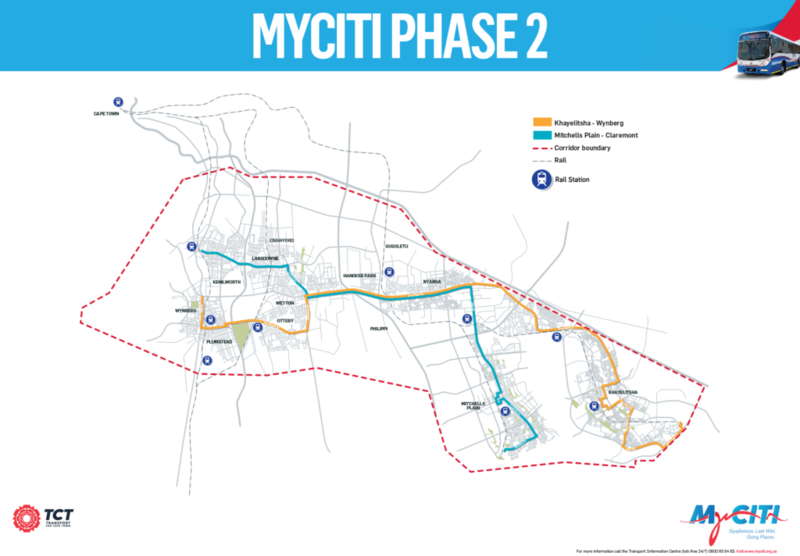 Of the16 MyCiTi routes planned to criss-cross the city of Cape Town, no fewer than five are scheduled to go through the heart of Philippi. 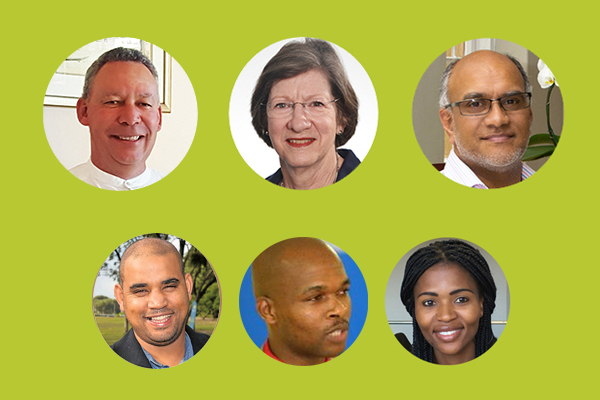 The City’s 2032 Transport plan includes a massive bus hub to be built on the outskirts of Philippi that will mean more so-called ‘trunk routes’ – main routes where special lanes are built for the buses. In addition to the ten new trunk routes, three more routes are planned for mixed traffic zones. Stock Road – which will be widened from two lanes to four lanes – is not the only one that will get a makeover. The City is also planning to upgrade New Eisleben, Sheffield, Govan Mbeki and Imam Haroon Roads (formerly Lansdowne Road) as part of the MyCiTi project. But residents of Philippi will know that work on Stock Road is now firmly under way. The road was kerbed on its eastern side last year, as part of the upgrade project, to make it safer for pedestrians. The current phase will widen the road to create the space needed for the buses. Eventually dedicated access lanes will also be built. The upgrade to this section is valued at R170m and will be followed by further work to accommodate bus stops and planned areas for formal trading. 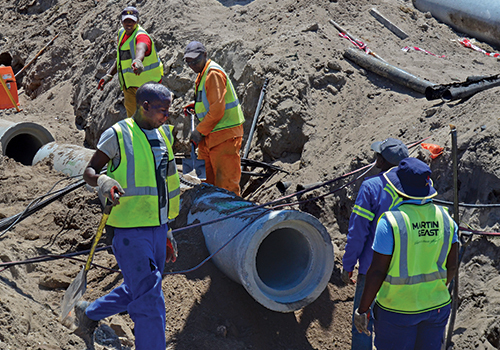 The City is planning to spend R4bn on expanding the service to the Lansdowne-Wetton Corridor. The map at right shows the two routes presently under construction as part of Phase 2 of the MyCiti project. 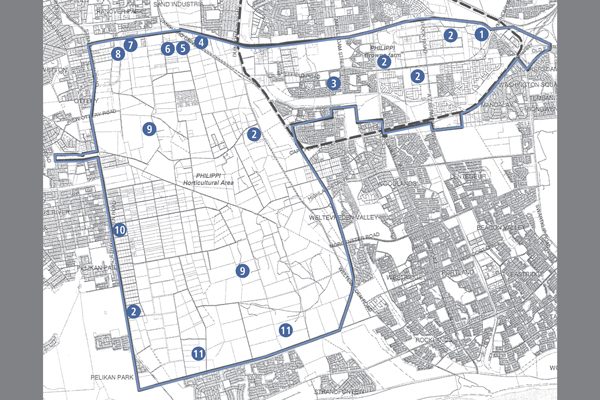 The blue route is the Mitchells Plain/Claremont corridor, while the orange route is the Khayelitsha/Wynberg corridor. 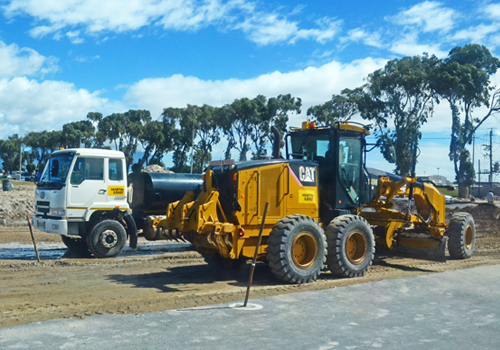 Both will serve Philippi along Govan Mbeki Rd, with one also traversing the full length of Stock Rd. 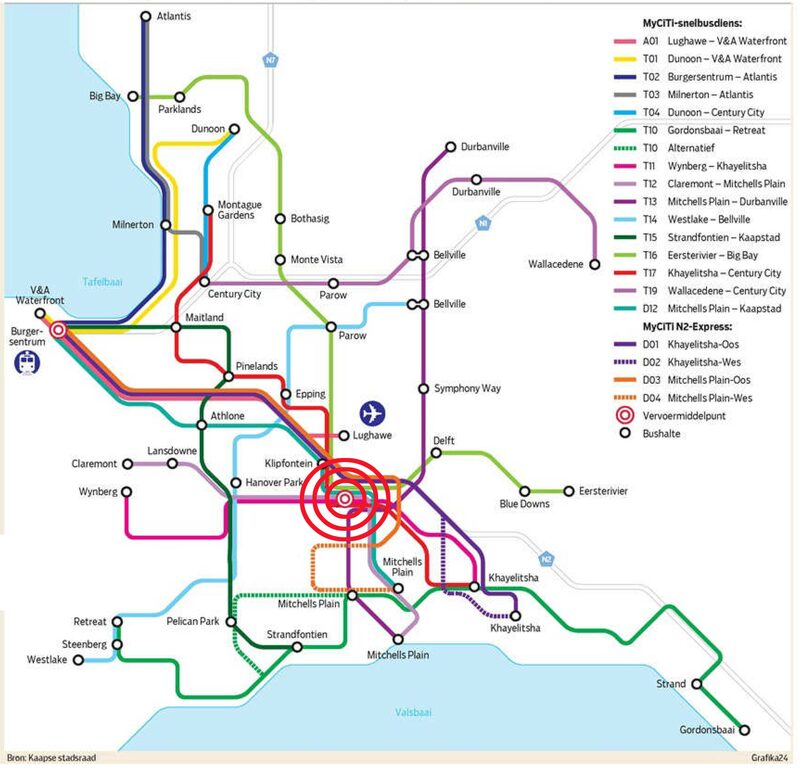 The map below shows all routes planned for the MyCiti project. The red rings indicating where the routes converge through Philippi show clearly how key the suburb is by virtue of its central location. 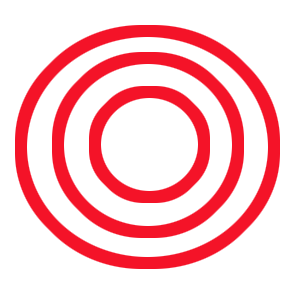 Categories: Game Changers, Home, Latest News, and Transport.